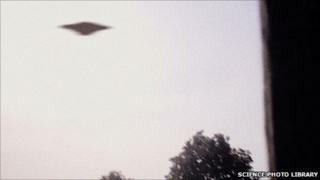 Is the truth about UFOs out there? Christmas has come nine months early for UFO researchers with the release of another tranche of hitherto secret government files. But the record of how the British authorities responded to the public over the "flying saucer" issue is fascinating in itself. For decades officials have been caught in a paradox which plays itself out as the reader browses the documents, free for the next month from the National Archives website. It is plain that the government does not believe that the UK is the target for visitations by extra-terrestrials, and no official wants to go on the record giving the idea credence. And yet when rational people send in drawings, sightings and even photographs there has to be an official response of some kind. The record shows that at one point no less than three sets of UK government officials were wrestling with the issue. They included a desk at the Ministry of Defence tasked with writing back to people who sent in reports. So the government has felt the urge to go through the motions for UFOs - even if there was a definite lack of actual spacecraft buzzing over Whitehall. But while it's a disappointment that there is no evidence here that the RAF has a secret stash of crashed spacecraft in Wiltshire, the files do amount to a fascinating insight into a minor public obsession with the paranormal, and how officialdom strives to deal with it. At least that's the view of Dr David Clarke, senior lecturer in journalism at Sheffield's Hallam University, for whom tracking the government reaction to UFOs has been a long-term passion. Dr Clarke has become a consultant to the National Archives, and believes that it's partly down to him and other researchers that the release of documents is happening at all. "Persistence pays off," he says. "There are two files in the latest release which relate to my requests for information." For Dr Clarke one of the more important releases relates to the only debate there has ever been in Parliament about UFOs. It happened in the February of 1979 - at the height of the "winter of discontent". Government and trade unions had locked horns - power cuts and strikes were the order of the day. Yet time was found by legislators to debate the paranormal. "It's amazing," says Dr Clarke, "that in the middle of all this they put aside a day to debate the existence of UFOs. Apart from anything else it's a moment in social history. "In the middle of profound crisis even parliamentarians needed escapism." Is there a cover-up in progress? The latest release of files reveals that some documentation relating to the 1980 Rendlesham Forest incident has disappeared. This is a key episode in British UFO "history", since it's been claimed that American airmen in Suffolk encountered a spacecraft in a forest near RAF Woodbridge. Investigations since have pointed to a nearby lighthouse as being the possible cause of the flashing lights reported by the personnel, but the fact that the relevant defence intelligence documents are no longer in the public record will intrigue many and frustrate others. They will see a conspiracy. Dr Clarke on the other hand, sees a blunder. He points to another file dating from 1967 when students placed saucers across England in a rag day prank. For a few frenzied hours the authorities believed aliens might actually have arrived. "But at no point does anyone suggest muzzling the media," he points out. The files are a fascinating read for those with open minds, even if they're left squinting at fuzzy photographs and marvelling at sketches of incredible looking spaceships. "I'm interested in why people believe in these things - regardless of proof," says Dr Clarke. "In hundreds of years time people will look back at these files and draw conclusions about the kind of people we were and the things we wanted to believe in."